L.J. Figueroa (30) and Mustapha Heron (14) led the way. @StJohnsBball. 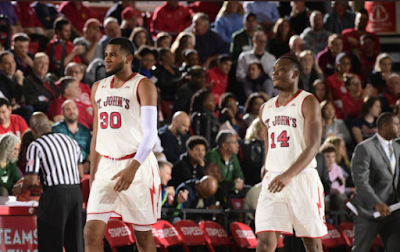 St. John's rolled past Rutgers, 84-65, on Friday night in Piscataway, NJ, in the Gavitt Tipoff Games. St. John's is now 3-0 on the young season, and they will be back in action on Monday night at 7 p.m. at Brooklyn's Barclays Center in the Legends Classic against California. Mustapha Heron led the way for St. John's with 27 points on 10-14 from the field and 4-5 from behind the arc, with 6 rebounds and 2 assists. L.J. Figueroa continues to emerge as a key player for this team, as he had 23 points on 7-13 shooting, including 6-9 on threes, with 11 rebounds to give him a double-double, and he notched 4 assists. Marvin Clark II had 12 points (3-8 FG, all three-point attempts), 3 rebounds, and 3 assists, while Justin Simon just missed a double-double with 10 points and 9 rebounds. Shamorie Ponds was held to 8 points (3-10 FG, 1-5 threes), with 6 assists and 4 rebounds. St. John's jumped out to a 15-7 lead on a Ponds jumper at the 13:31 mark of the first half, but Rutgers responded and pulled to within one, 24-23, on a three-pointer from Peter Kiss with 4:49 left. Figueroa made a pair of threes over the next minute, and a Justin Simon three-pointer with 33 seconds left gave the Red Storm a 33-25 edge at halftime. In the opening minutes of the second half, it was all St. John's, as Heron had back-to-back threes to open up a 14-point edge, 51-37. They eventually built that up to 23, at 67-44, when Clark II hit a three with 8:33 remaining. The closest Rutgers got was 15, at 74-59, when Issa Thiam made a three-pointer with 4:39 left, but St. John's responded with a 10-0 run to put the game away.